Well, it nearly took me a year to keep my word, but here it is at last, a description of how I made my scrappy cartwheels quilt. In my mind, I've dubbed it "Whirlygiggles," which is a totally fantastic name that my friend Peggy came up with. If it hadn't been for Beth and Kristin of Sew, Mama, Sew! writing to me and asking me if they could feature my quilt as Quilt of the Day (um, yes, how thrilling is that?! ), who knows how many more months or years it would have taken me to get my act together and do this little tutorial? So here we go. To make the template, you need thin cardboard, template plastic, a plastic lid, whatever you've got handy. 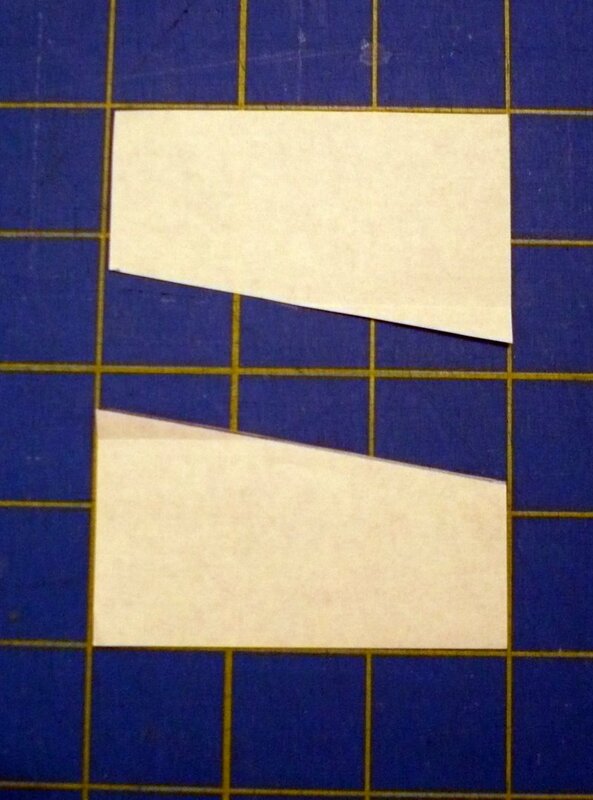 Cut a square out of it, one fourth the size you'd like your final block to be. 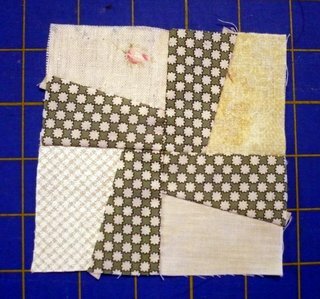 For example, if you want your block to be 4 inches finished, like in my original quilt, you'll cut your template to be 2" x 2". In this picture, the square is 3" (only because that happened to be the size of origami paper I had on hand) which would give you a finished block of 6". 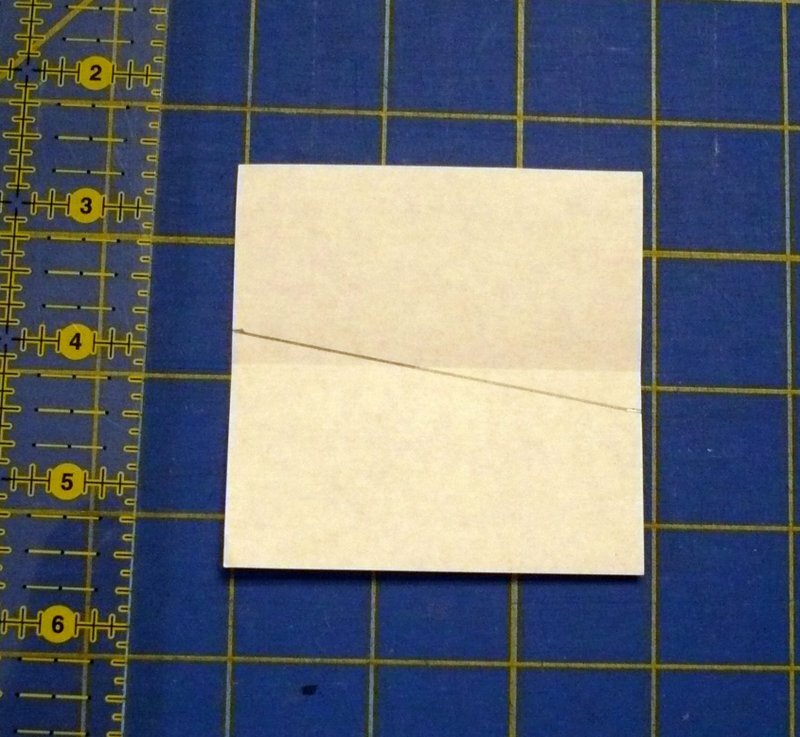 Take the square and make a mark a quarter of an inch above the halfway point on the left side of the square, and a quarter of an inch below the halfway point on the right side of the square. Connect the two marks you just made, cut on that diagonal line, and there you have it! Identical templates, two for the price of one. Can't believe it was that easy, can you? One important tip: it is crucial to note which side of your template you want to be the "right" side. In my example, there's a white side and a pink side (can you see it? If I'd thought it through, I would've used a different color, sorry). It doesn't matter which side you pick, you just have to designate one side as "right," and one side as "wrong." 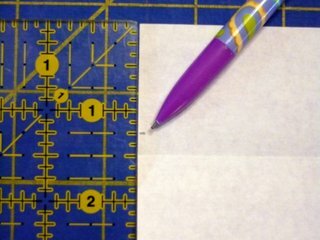 You only need one little template for your entire quilt, each completed block is made from 8 pieces. 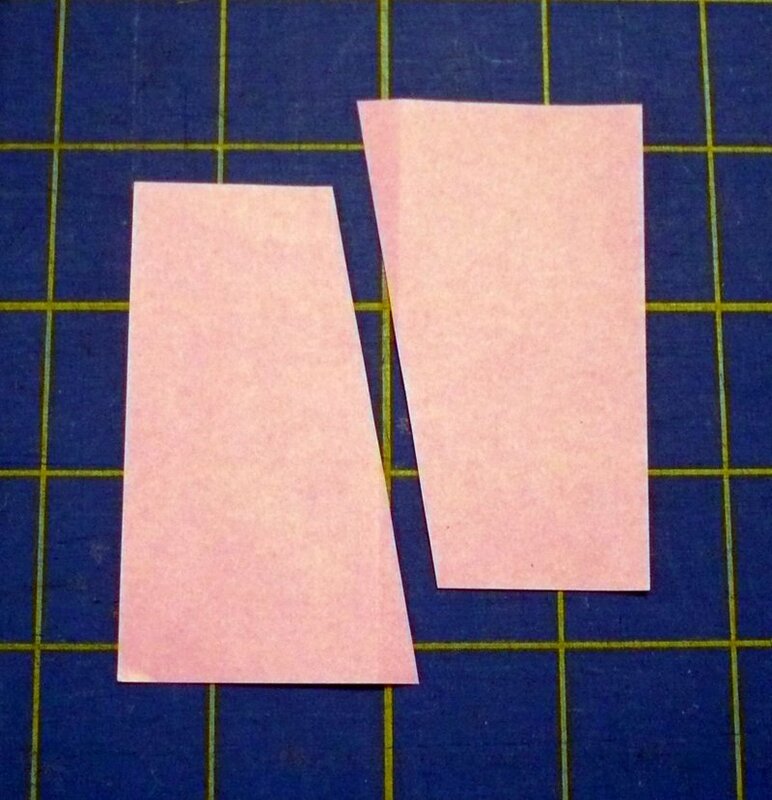 4 are cut from light fabric and 4 are cut from dark fabric. 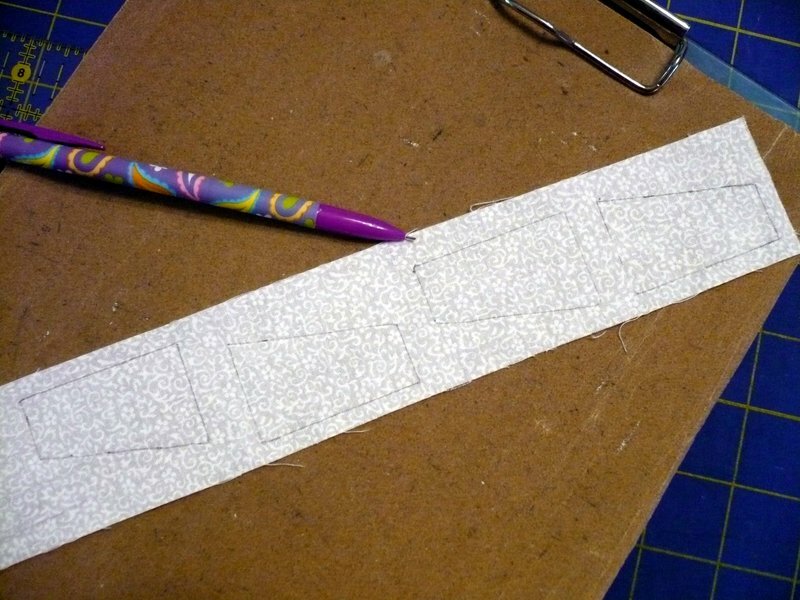 It doesn't make any difference if you rotate the template as you trace to save space on your scraps of fabric. Top and bottom doesn't matter, but it does indeed make a difference if you accidentally flip the piece over while you're tracing. Get it? Kind of hard to explain in words, but trust me. If you make the mistake once, you'll understand pretty quickly. When I trace my template, I use a mechanical pencil with an ultra fine lead (.5 mm), and a clipboard with a piece of fine grit sandpaper attached, which keeps the fabric from dragging underneath your pencil. 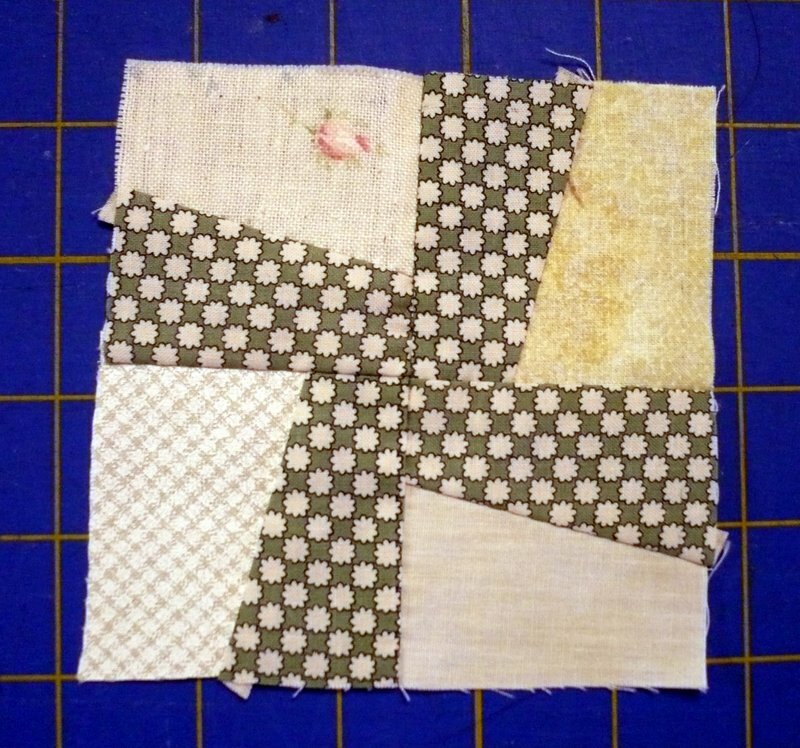 Truly, this is a great quilt to make from your scraps. The white strip above is only about 2" x 10". The template you made does *not* include the seam allowance, so don't forget to leave a quarter of an inch extra all the way around. 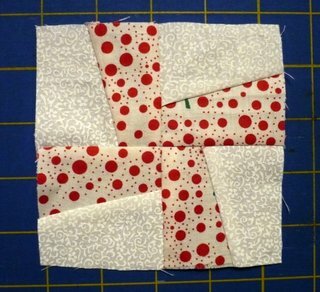 Next, cut out all your pieces, and then it's just a matter of sewing a light to a dark, and four pairs together to make a pinwheel. The block can look vastly different, depending on what fabrics you choose. 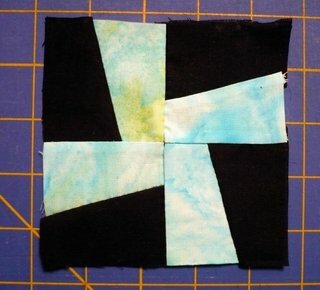 My original quilt was done with 4 different light fabrics in each block. But you could also use the same background in every block. Or mix batiks with solid black, reproductions with white muslin, even fussy cut some novelty fabrics or kids prints for each pinwheel. Let your love of fabric determine what direction your quilt takes, but I hope you try this block, and maybe even give hand piecing and hand quilting a try. A doll quilt is a great place to experiment. If you have any questions, or if there is anything that needs clarification, please feel free to email me or leave a comment, I'll try to help in any way I can. Although, Typepad is being a bit selective in which comments it wants to send me, so if you don't hear from me within a few days (I'm leaving town tomorrow but will be back Sunday night), please try again. I'm so happy that you stopped by. Thanks for posting this! I've been in love with that quilt since I first saw it in the doll quilt swap! This is so great, Michelle! Thank you so much for doing this. I can't wait to hit the scrap basket and try it out. I love the quilt also! I have looked at it quite a few times. Thanks for the template. Thanks so much for this awesome tutorial. I just have a question. 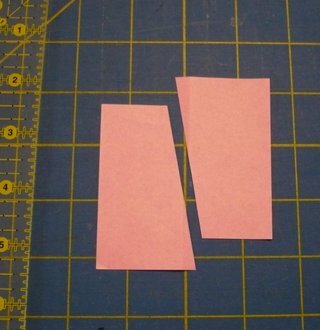 When you say: "leave room for seam allowance", does that mean that the template doesn't include seam allowance and I should cut the pieces bigger than the template itself? Sorry if it's a silly question! i love your version of the pinwheel. i'm not a fan of the traditional block, but this i love! Thanks so much for sharing the template/tutorial! I've been itching to make a quilt lately and this seems like a nice one to do. Your quilt is featured - how cool is that?! Congratulations! Great tutorial, thanks so much for putting it together! Well that seems easy enough! I'll have to give it a try! Thanks for this tutorial! I am simply in love with this block! And add "clipboard & sandpaper" to my list when I pick up that embroidery hoop. Thank you for this! I can't wait to try it. Great tutorial, Michelle! I'll have to try this sometime. I loved your original quilt. Wonderful tutorial! I going to use this as a sewing project for my daughters (ages 12, 11, 9 and 7). They love to sew and this will be a fun one! Great tutorial Michelle - thanks! Thank you for your tutorial. i will definately give it a try. I love this quilt....thanks for the great tute! i am so happy to finally have this tute on the template. i loved your quilt when i first saw it and this will be the next quilt i make! Thanks for sharing a great tutorial and a great template! thanks for the tutorial, michelle! that is a great little quilt. What a great way to use up scraps! I love the look of the mixed up background pieces the best. 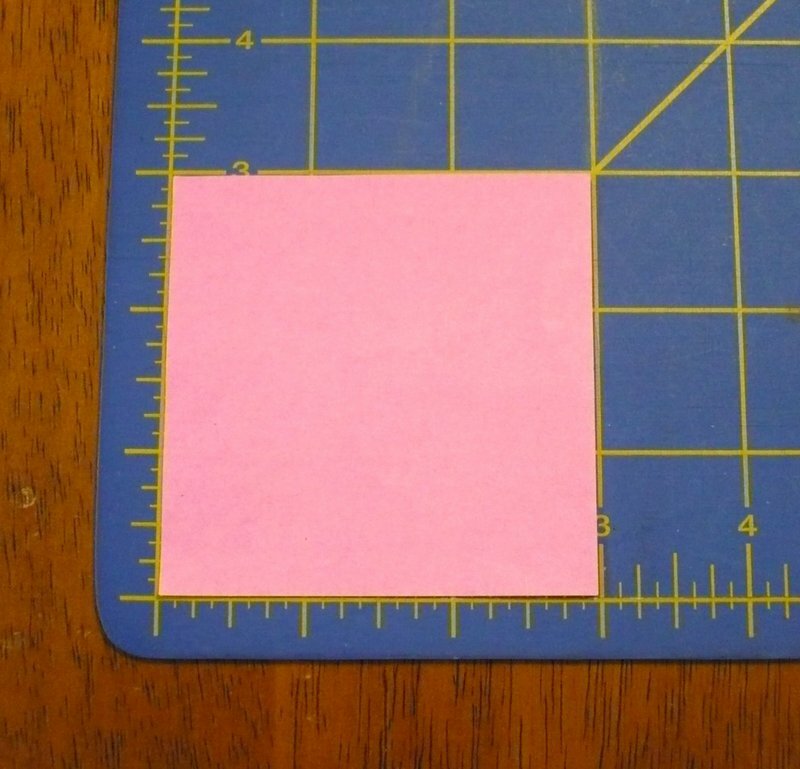 I have a ruler called "add a quarter ruler" that would be so useful to put along the marked lines form teh template and cut against when cutting out the pieces... I wonder if any of the other comement posters above have heard of this type of ruler.. also you could simply use a clear ruler with the 1/4" mark... since it is all straight lines. I just made an adjustment that ended up using less fabric, and made it easier to cut. I made the template, adding in the 1/4 inch seam allowance, but I also cut out 3.5 inch strips of my fabric, and then laid the template on the strip, placing my ruler on top of it, and then used my rotary cutter to cut the shapes, and I just flipped the template (keeping the top side up!) working my way down the fabric strip, easy peasy! couldn't you just stack a bunch of charm squares, and cut them the way you did the template? this way you skip the tracing, etc?